FlourChylde bakery is a hidden gem nestled in the hills of Novato. 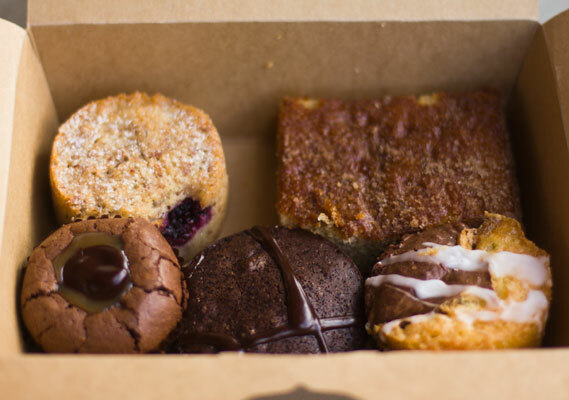 Making weekly appearances at San Francisco farmers’ markets, flourChylde serves a variety of flawless GF baked goods. After offering wheat free items during Passover several years ago, their customers insisted that their gluten free treats be baked year-round. Since then, flourChylde’s Novato café and bakery has offered a large selection of specialty GF cakes, pies, and lunch options. The flourChylde farmers’ market stands are packed with a variety of their most popular gluten free treats. The owner is happy to pass out samples and provide you with mouthwatering descriptions of every delicious item. Find them on Sundays at the Ft. Mason farmers’ market. Above, is a selection of GF baked goods from the Ft. Mason farmers’ market stand. Please note: FlourChylde Bakery serves non gluten free items in addition to their array of GF options- they do separate their baking surfaces, but are not a certified gluten/wheat free bakery. Check out their website www.flourchyld.com for farmers market locations and updates.